Grant Romney Clawson was a painter whose artwork hangs in Mormon temples and meetinghouses all over the world. His career spanned 42 years. He created hundreds of paintings with religious themes, and also sold western-themed paintings through art galleries. 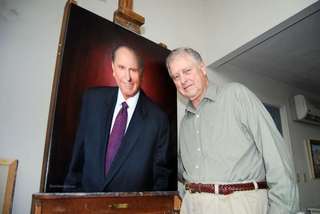 He invested over 300 hours in his painting of Prophet Thomas S. Monson, current president of The Church of Jesus Christ of Latter-day Saints. The painting hangs in the Salt Lake Temple with paintings of the past fourteen prophets of the Church. All but one of the paintings was painted by Clawson, who passed away on July 10, 2016, just shy of the age of 89. Clawson was a great-grandson of Brigham Young, and Brigham Young's portrait is the only one he didn't paint. Clawson was a self-taught artist, who wanted to be recognized for his artistic talent even in grade school. He experienced a revelation as a young child that in the future, he would paint for the temples of the Lord. He felt called to that work ever since. On the way to his career as an artist, Clawson served as an army cook in Korea and had a 16-year stint with KSL-TV. He started as a floor manager and worked up to production manager. But Clawson's heart wasn't in television. In 1957, he began painting on the side and entered as many art contests as he could find. The more he painted, the less interest he had in a television career. In the late 1960s, through a series of events, Clawson was given the opportunity by Elder Mark E. Petersen to paint an enlarged version of Harry Anderson's "John the Baptist Baptizing Jesus." After months of work, it was accepted, and Clawson was commissioned to produce several more enlarged paintings, which now hang along the wall at the North Visitors Center at Temple Square. Clawson also painted the 66-by-14-foot mural titled "Go Ye Therefore" that resides in the lobby of the Church Office Building. If one looks closely at his paintings, one will find the faces of Clawson's family members. "It's the greatest compliment to be in one of his paintings," said Megan Clawson Doezie, Clawson's youngest daughter and art agent. "He has a way of making everyone feel important. It's fun to go to the visitors center and see the faces in the paintings." While Clawson has produced several original paintings, both religious and nonreligious, much of his church-commissioned work has involved painting enlarged murals of Anderson's smaller originals. Each time, Clawson added his personal touch to small details. When Anderson saw the size of the mega-canvas in the Church Office Building, he said if he ever had to paint something that big, he would faint. But Anderson's work was a big part of Clawson's life. Clawson has drawn inspiration through the years from daily reading in his Book of Mormon. The influence of the Holy Ghost has also played a role in his numerous paintings. Clawson was dedicated not only to consistent reading of the scriptures and following the promptings of the Holy Ghost, he also recorded his hours, details, and thoughts as he works. He filled 38 spiral-bound journals since 1968. Clawson and his wife, Irma, have six children, 12 grandchildren and 10 great-grandchildren. They are all big fans of grandpa, but so far no artists have emerged to take up the brush. They have, however, already started to stake their claims on his artwork. Clawson enjoyed associating with church leaders and seeing others enjoy his many pieces of artwork over the years. He credited his wife, family and friends for their support. This page was last edited on 12 July 2016, at 15:08.